If you're a fan of premium smartphones, chances are you've been charting the rise of the Huawei and its handsets – and if so then the new Huawei Mate 20 Pro and Mate 20 are going to pique your interest further. These two new flagships incorporate the best technology the brand has to offer, with the Mate 20 Pro adding high-end features – including a genuine world's first. While we don't have exact prices for most of the world, we do know they'll be among the pricier phones on the market. In Australia the Huawei Mate 20 Pro is AU$1,599, which is significantly more expensive than the standard Mate 20, which is AU$1,099. In the UK the Mate 20 Pro is £899. We also have the euro pricing: €1,049 for the Mate 20 Pro, €799 for the 4GB and 128GB version of the Mate 20, and €849 for the 6GB and 128GB Mate 20. We don't have US pricing yet, but those Australian prices convert to roughly $1,140 for the Mate 20 Pro and $780 for the Mate 20, while the euro prices convert to around $1,215 for the Mate 20 Pro and $925 / $985 for the Mate 20. We've had a decent amount of time with both phones, so here's our hands-on Huawei Mate 20 Pro review and our hands-on Mate 20 review. The standout performer of the two handsets is the Huawei Mate 20 Pro, which offers a high-end spec list. Let's start with the world-first feature, though: if you've got a friend in dire need of some battery life, and their handset supports wireless charging (we're thinking the Google Pixel 3, for instance), you can place it back-to-back with the Mate 20 Pro and get some juice across. Talking of battery, the Mate 20 Pro's 4,200mAh power pack should be one of the stronger ones on the market – during our five-day preview time with the phone we noted that "we've gone a full eight-hour work day (with no charge breaks) and still had 79% battery left", which is pretty impressive for a top-end handset. The innards are strong too: the new Kirin 980 chip from Huawei is combined with 6GB of RAM and 128GB of storage, with additional space provided by a nanoSD card. This is a new format from Huawei, meaning it'll be more expensive to expand the storage on this phone. The display is probably the most impressive thing on the phone (well, after the battery life, if it can last as long as it seems) and you'll be getting a 6.4-inch curved OLED display, and a WHD long-style display (19.5:9, if you're getting technical), which means 3120 x 1440 resolution packed into the small frame. The camera is the other high-end spec to let you know about, with 40MP, 20MP and 8MP sensors on the back promising great low-light performance, ultra-wide angle snaps and a 3x telephoto zoom, while there's a 24MP sensor on the front for selfies. Both the Mate 20 Pro and Mate 20 come in five colors: black, pink, Midnight Blue, Emerald Green and a blue-to-purple Twilight option. 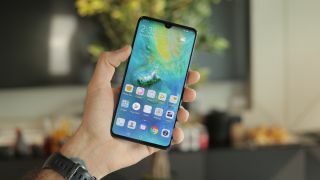 If you want to find out more, then you know what to do: head to our hands-on Huawei Mate 20 Pro review. So why might you want the Mate 20? Well, firstly it's cheaper, but it brings many of the same specs as the Mate 20 Pro, with the same Kirin 980 chipset, 6GB RAM (there's a 4GB variant, too) and the EMUI user interface based on Android 9 Pie. The camera array is a triple-sensor affair, although it's not as impressive in terms of the megapixel count, with 16MP, 12MP and 8MP sensors in the mix, although it's still 24MP on the front. The battery is only 4,000mAh, but that should still last a decent time, and the display is larger: 6.5-inch but only Full HD resolution: 2244 x 1080. You can also expand this phone's internal storage up to an additional 256GB using the nano SD slot inside, and as mentioned you're also getting the same color options as for the Mate 20 Pro.